"Flames of vengeance hide the truth, touch of ashes feeling smooth, nightskies give us shelter not, set your sails and loose the knot. South sea haven to be found, fruitful trees and rivers sound, venture forth toward the sea, believe it and be free." Nearly 150 years ago, the great Surge brought destruction to the southern coast of Calandhor. Wiping various settlements off the face of Athor, the Surge barely missed the populous town of Lumiar. When the waters of the sea settled again, the shocked townsfolk put great effort into the construction of a massive dam, a structure that dominates the sight of the harbor to this day. What happened next may look like a perfect irony of history in hindsight, but threw the lives of hundreds into chaos at the time. As if the primal spirits of nature were to defy the effort put into the construction of the dam, the tragedy of 99 a.S. struck the crowded town where it was least protected. Walls and dams may hold of bandits and tidal waves, but no amount of defenses can withstand the powers of fire and wind working in conjunction. How many candles, torches and fireplaces have lived and died in the streets of Lumiar? No one knows, and no one knows for sure where the fire started that would devastate a large area of the harbor and market district. Many died in the inferno, and hundreds lost their homes. Some left the town to settle in Korstone, Mountaingrass or Ashgarden, while others tried to rebuild. Fisherman Letran Martender however had another plan to escape the misery. Having lost everything besides his ship to the flames, he and his wife Carla tried to convince others to join them in their search for a new home somewhere in the Southern Sea. From the ashes that covered the harbor district grew the small flower of hope, and many were willing to accompany the two on their journey. Two months and six days after the night of the great fire, a brave fleet of seven ships left the harbor of Lumiar, heading south into the dawn. Seemingly enraged by this bravery, the sea crashed it's fists against the fleet three times, and buried three of the vessels in the eternal waters. Four vessels reached the beaches of the island Zhor, a barren rock at first glance, but surrounded by a rich variety of sealife. This is the nature of the elements: One day the rough sea tries to kill you, the next day you harvest it's treasures. While the island is not at all suited for farming, full fishing nets ensured the survival of Letran, Carla and the others, and their descendants inhabit the settlement to this day. 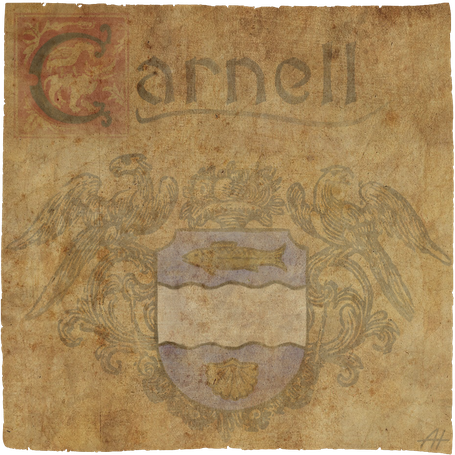 It's not sure how the name "Carnell" came to be, but it is likely Carla created it from the old Antrach word for "southwest", since the island Zhor marked the southwestern corner of most maps stemming from the time of the Antrach Empire. The whole island of Zhor including the village of Carnell will be accessible in the free demo of Crevice which we'll release for free asap!